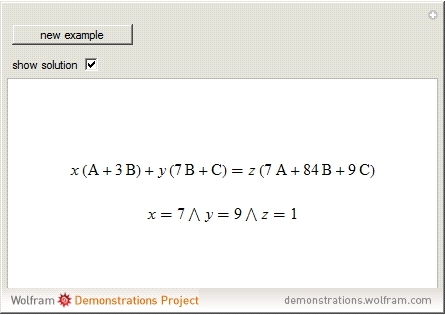 The free module of rank over a nonzero unit ring , usually denoted , is the set of all -tuples (called vectors) where . We are particularly interested in , where is the ring of integers, which can be embedded into the vector space , where is the field of rationals. If a system of linear homogeneous equations with coefficients in has nontrivial solutions in rationals, it also has nontrivial solutions in integers. The unit vectors are interpreted as atoms, while all other vectors are molecules. As an example, balancing the chemical equation means finding a solution in positive integers for the equation . 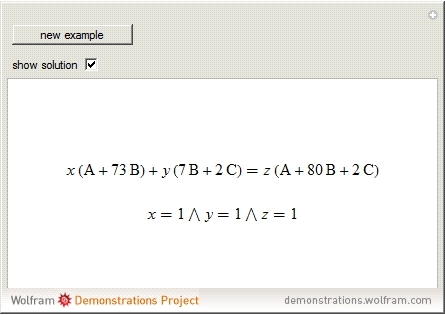 This Demonstration generates and solves some simple equations in the free -module over the set of abstract elements. Only one solution is given. Many problems in chemistry can be solved in this way . D. E. Goldberg, Schaum's 3000 Solved Problems in Chemistry, New York: McGraw-Hill, 1988. 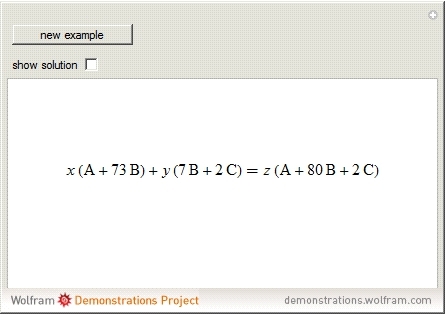 "Free Modules for Balancing Abstract Chemical Equations"